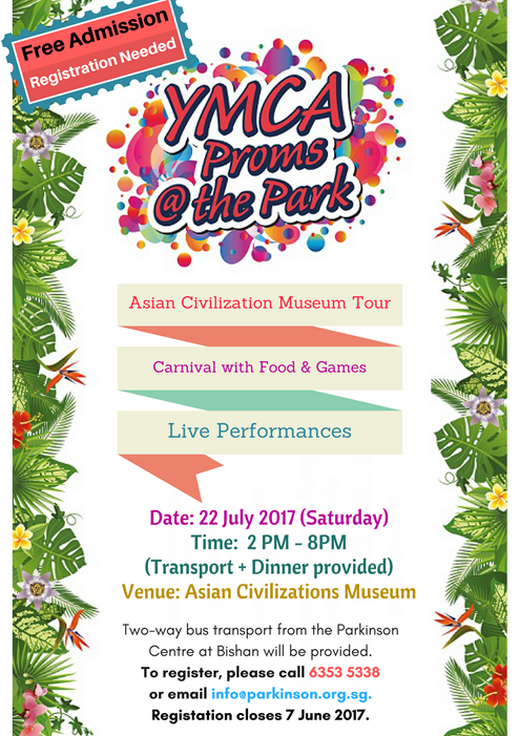 Parkinson Society Singapore will be participating in the annual YMCA Proms @ the Park event, along with corporate volunteers from the YMCA Proms @ The Parks. Two-way transportation will be provided to and from the Parkinson Centre at Bishan. Each participant may bring one caregiver along with them. There are limited slots available, and registration will close by 7th June 2017 or when all slots are filled. If you would like to register, please fill in the form on the PSS webpage (http://parkinson.org.sg/Events_info.php?e_id=44 ), call The Parkinson Centre at 6353 5338, or email info@parkinson.org.sg.